The China Diary of George H. W. Bush: The Making of a Global President. Bush, George H.W. ; Edited by Jeffrey Engel. 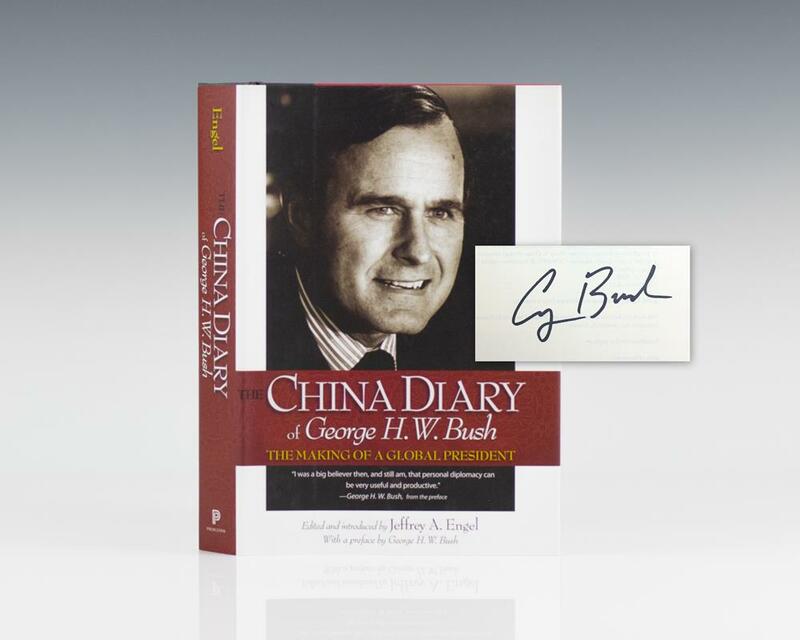 First edition of Bush’s diary he dictated while de facto U.S. ambassador to the People’s Republic of China in 1974–75. Octavo, original half cloth, illustrated. Fine in a fine dust jacket. Signed by former President George H.W. Bush and former Secretary of State Henry A. Kissinger on the title page. Rare and desirable, signed by Bush and Kissinger. "George Bush's year in China laid the foundations for the pragmatic, prudent, personal foreign policy that would characterize his presidency. With superb annotations and analysis by Jeffrey Engel, a professor of history and public policy at Texas A&M, Bush's daily diary sheds light not only on 'the making of a global president' but on two nations in transition: late Maoist China, as it moved, tentatively, toward engagement with the international community; and the United States, as it absorbed the implications of defeat in Vietnam" (Glenn C. Altschuler Baltimore Sun). "The book is of unique historic, theoretical and practical value. Its ideal readership consists of international studies scholars and students of various disciplinary backgrounds, with particular interest in China studies as well as diplomatic and international business practioners. I highly recommend it" (Wenshan Jia Journal of Chinese Political Science).